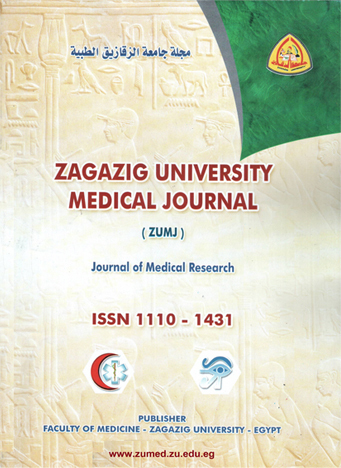 EXPRESSION OF LGR5 AND BETA-CATENIN IN BENIGN AND MALIGNANT COLORECTAL LESIONS IN ZAGAZIG UNIVERSITY HOSPITAL. Background: Lgr5 -(GPR49) a Wnt target gene- is one of the most important cancer stem cell markers that have been isolated in colorectal cancer (CRC). The potentiation of Wnt/Beta-catenin signaling is now believed to mediate the self-renewal and proliferation of Lgr5 stem cells. Aim: to evaluate the expression of Lgr5 and Beta-catenin in colorectal cancer and benign colorectal lesions. Methods: Representative sections from thirty benign lesions [22 colorectal adenomas, 8 ulcerative colitis (UC)], and 30 CRC cases were stained by immunohistochemical technique using anti-Lgr5 and anti-Beta-catenin. Results: High Lgr5 expression was found in 0%, 60%, and 70% of normal mucosa, benign lesions, and CRC, respectively. Higher grades of Beta-catenin expression compared to normal expression was found in benign lesions as 23.3% for grade II and 6.7% for grade III and in CRC as 73.3% for grade II and 20% for grade III. Significant statistical differences between control groups, benign and malignant lesions in both Lgr5 and Beta-catenin expression were found. Conclusion: Lgr5 is highly expressed in CRC. That may suggest a role in carcinogenesis based on the CSC hypothesis. Also, Beta-catenin is activated in most CRC.